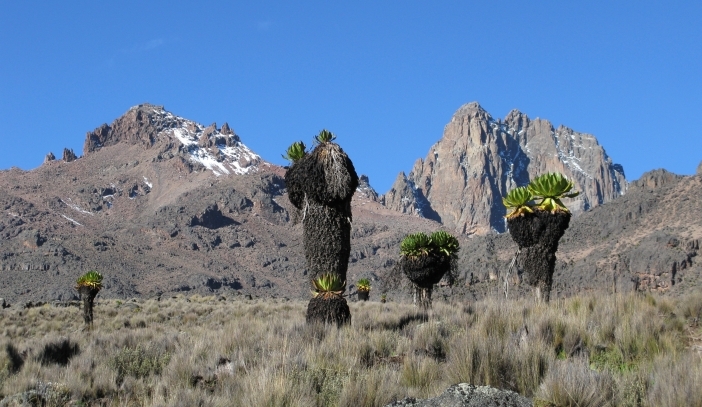 This combines two of the most famous climbing routes on Mount Kenya – the Sirimon and the Chogoria Routes – and make the tour a remarkably diverse and spectacular hike. Sirimon Route, coming from the west, passes through the dry areas of the mountain with giant trees and rocky terrain. The descent on the Chogoria Route is exactly the opposite with lush bamboo forests and highlands. The ascent to the summit is as difficult as any rise in eastern Africa, but the rest of the hike is generally perceived as easier than the Kilimanjaro tour. You leave Nairobi at 8.30am, transfer to Sirimon Park Gate (2660m) the base of your Mt. Kenya trail. Here you meet with guides / porters and start your climb at 10am. After a 3-hour walk with lunch on the way, you will head to Old Moses Camp (3300m) on the edge of the mountainous forest where you will spend the night. You leave the camp at 8.30am and continue your hike through the moorland characterized by many varieties of senecia and lobelia to Shiptons Camp (4200m). Lunch will be taken on the way. The 14km-hike takes about 6 hours. Overnight will be at Shiptons Camp just below the 3 majestic peaks – Batian, Nelion and Lenana. After an early morning breakfast at 4.00am, the trek leads via a steep scree to Simba Cole and on through rocky terrain to Point Lenana. After summit photos you will descend again to Simba Cole and continue to Mintos Hut (4200m). Here you have a lunch break, before passing along a ridge overlooking Gorge Valley and Lake Michaelson. In the late afternoon you will reach your destination for the day – a fly camp at the road head at 3300m. You descend to Meru Mt. Kenya Bandas at 3000m. On your short 2-hour hike you may encounter buffalo, klippspringer, zebra and sometimes elephant. At the bandas 4×4 vehicles will be waiting to drive you through a dense bamboo forest on slippery roads to Chogoria. Here you will meet your driver, have lunch before biding the crew farewell and proceeding to Nairobi or your next destination.